Along with the development of the internal organs, your baby has developed some protections for the uterine environment. The Vernix Caseosa, a cold-cream type substance, is secreted from his oil glands to protect his skin from the amniotic fluid. Downy hairs called Lanugo hair have grown on his skin which may help hold the vernix in place as well as help regulate his temperature. He has a primitive immune system, which does offer him limited protection from infection and illness. He is also developing a special type of fat called “Brown Fat” which helps him regulate his temperature. Deposits of brown fat will continue until he is born, at which time the fat will begin to dissolve. 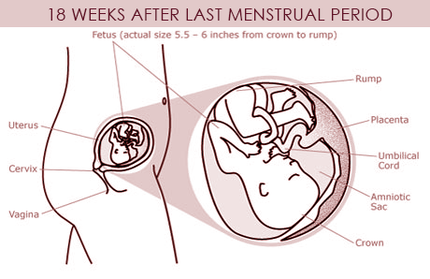 At the end of the 20th week your baby will be around 7.5 inches from crown to rump and weigh 1 pound, and baby’s kidney’s are now functioning well enough that they can make urine. Your nausea should have disappeared by now, but you may be feeling heartburn or indigestion when you eat. You may also be experiencing some constipation and pelvic pain. Although some pelvic pain is normal due to the relaxing and stretching of the pelvis, you should seek the advice of your caregiver if the pain is excessive or interferes with your regular activities. You should be feeling the baby’s movements by the end of this month. You may also have grown enough that you begin to see stretch marks.